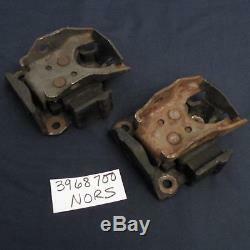 NORS-No Brand 67-72 Chevy Passenger Chevelle Nova Camaro Engine Mounts-2 3968700. Got a'67-'72 Chevy? 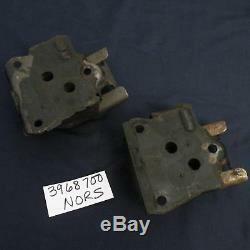 This listing is for a PAIR of NORS Engine Mounts. NOTE: There is no brand marking on these. 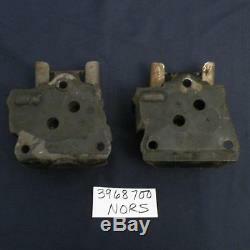 They were found in a box of GM 3968700 mounts so I believe that they function as those. 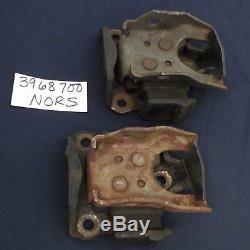 In the parts catalogs, the Part Number 3968700 shows a progression to 3990918 & 3962748. 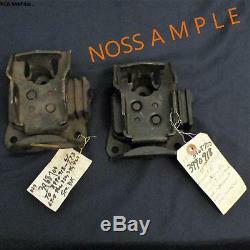 I've included an "NOS SAMPLE" photo that shows a 3968700/3990918 set for your visual reference only. If you have any questions or see anything I've missed, please let me know - this is my best guess. Group Number: 0.27 - Mounting Assy. 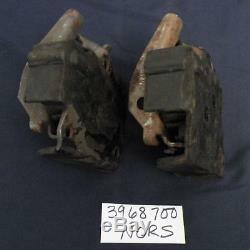 Part Number: 3968700 (Use 3990918 & 3962748) - 2 Required. 1969 ALL (302) --------> ALL = Passenger, Chevelle, Nova, Camaro. 1969 Chevy II, Camaro (396). 1969 ALL (350) --------> ALL = Passenger, Chevelle, Nova, Camaro. 1970 ALL (396) --------> ALL = Passenger, Chevelle, Nova, Camaro. 1970 Passenger with 2BC (400). 1970 Chevelle with 4BC (454). 1970 Chevelle with 4BC (400). 1971 ALL (454) --------> ALL = Passenger, Chevelle, Nova, Camaro. 1972 ALL (454) (except Police) --------> ALL = Passenger, Chevelle, Nova, Camaro. 1972 Passenger, Chevelle, Camaro (except Police) (402). NOTE TO CAR PARTS BUYERS: We list information and applications as a general reference only. It is your responsibility to do your own research to make sure this is the exact item you need. We don't have an inventory list for our car parts. Examples: 67 Impala, 60 Corvette or 65 Truck. If you need help, send us a message. Just a bit about iowa_bowtie car parts. Our inventory is old Chevy dealership stock. We have New Old Stock (NOS) from the 30s to the 80s. Almost all are GM NOS for Chevrolets, but sometimes they fit for other GM models (Buick, Oldsmobile, Pontiac and Cadillac). We try to list pairs if we have them available (if a left and right are needed), but sometimes we will find a mate later so keep watching each week. Whether you are looking for parts to keep your oldie on the road, restoring your dream cruiser, accessorizing your bomb, or riding slow in your lowrider, join our group of Classic Car Fans. Thanks for your support and inquiries... We appreciate all our car lovin' friends! We do not mark merchandise values below value or mark items as "gifts" - U. And International government regulations prohibit such behavior. Powered by SixBit's eCommerce Solution. 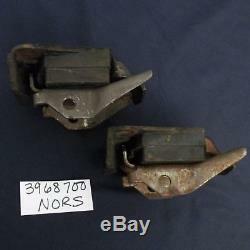 The item "NORS-No Brand 67-72 Chevy Passenger Chevelle Nova Camaro Engine Mounts-2 3968700" is in sale since Thursday, April 5, 2018. 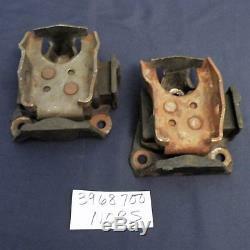 This item is in the category "eBay Motors\Parts & Accessories\Vintage Car & Truck Parts\Engines & Components\Motor Mounts". The seller is "iowa_bowtie" and is located in Fredericksburg, Iowa.